Hi Beauties! How is the start of everyone's 2015 going? It is really hard for me to go back to work today after 2 weeks off! 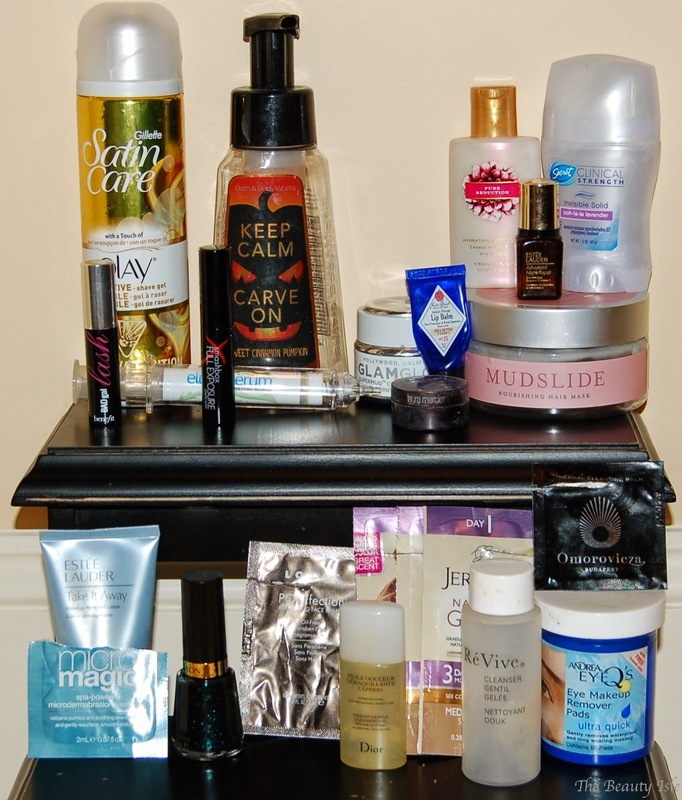 Welcome to my first beauty empties post of 2015. The past couple of months I tried to go through a lot of my samples. I've decided that it's silly of me to save a million samples "for travel" when travel happens 1-2 times per year and not even for that long each time. So when I do travel, I don't really go through THAT many travel size products and at this point a lot of them are getting old so I've decided to start using them. I did finish a lot of sample size products, but I only included those if I felt that I could actually form a real opinion on after only 1-2 uses. This is the best hair mask I've ever used. It actually made it to my top hair products of 2014. I have a ton of hair masks to get through but I would buy this again. This came in a GWP. I hated using this on my face so I used it on my brushes and it was fine. I wouldn't purchase. I got this as a free gift somehow and I didn't like it on my face so again, I used it on my brushes and it was fine. I wouldn't purchase this. The GlamGlow masks are my favorite masks in existence. They were in my list of skincare favorites of 2014. This is expensive so whenever there's a discount I stock up. I have a couple backups of this. I got suckered into buying this eye serum from a great deal on Groupon. This showed zero benefits to my under eyes. I wouldn't repurchase. This was a great face cleansing oil. It removed all of my makeup with ease, including my waterproof eye makeup. It also rinsed clean and didn't leave me feeling oily (of course I washed my face again with a normal face wash after using the oil). I wouldn't purchase because I have a lot of face cleansers to get through. I loved this lip balm. It was almost like a light vaseline. I would repurchase but not anytime soon because I have a ton of lip balms to get through. I've gone through so many samples of this product and I've never noticed any improvement in my skin. I wouldn't purchase this. I hated this a lot. It smelled like rotten garbage and felt really gross on my face. Yes, it's a cleansing "balm" but the slippery feeling didn't really rinse off after. I would never purchase this. Although this was a foil packet and I only used it once, I could tell that it's a great face scrub. It was just abrasive enough without hurting. If I were in need of a scrub, I would try this one. This deodorant works really great for me and I have several backups. This was cute to have around in the fall. It had a really nice pumpkin/cinnamon scent. Thank the heavenly stars that Jergens did something to this stuff to make it not reek! This has always been a great product that provides a nice gradual tan but the stench used to be intolerable. They've reformulated it and now it actually smells nice. I went through 3 little samples of this and have a full size tube of it to use next. I love the scent of this and would purchase it if were on sale. This is my second bottle of this stuff that the dispenser has gotten stuck. I won't purchase this brand of shave gel anymore. I get these from Christmas Tree Shops so they're pretty cheap. They work well at removing my waterproof eye makeup but they are extremely oily. I would purchase these again. This mascara was just ok. It darkened my lashes and fanned them out a bit but I have better drugstore mascaras. I wouldn't purchase. This nail polish looks really pretty in the bottle but it seriously takes 4 coats for it to not look streaky and even then it has a dull matte finish. I've used it twice and I'm tossing it. This primer was fine. I didn't notice anything special about it. I have tons of primer samples to get through so I won't be paying money for a primer any time soon. I've had this concealer for a really long time. It's extremely thick and does a decent job at covering dark circles but it really sinks into fine lines. I wouldn't repurchase. This did nothing for my lashes. It barely darkened them or added any volume. I wouldn't purchase. Well those are 2 months worth of empties there. I'll try to go back to doing empties monthly depending on if I have enough to warrant a full post. Have a great week everyone!